Reason for Visit: Came back to pick up the trailer, do some skiing at “The Bird” and see our friends the Careys. The Living Room Lookout Trail: A moderately challenging < 3 mi trail with a decent view of SLC. Dogs are allowed on leash although most people did not have their dogs on a leash when we were there. Publik Coffee Roasters: Good coffee and snacks, big open space, good wifi, and easy parking. The People’s Coffee: Great coffee, very friendly staff, cool atmosphere, solid wifi, and easy parking. Marmalade City Library: A clean, modern library with free wifi and a coffee shop called Moka. La Barba Cofee: Good coffee, a decent amount of seating and wifi. A bit on the hipster side but the barista was friendly. Same Sushi: Quality sushi at a very reasonable price and no wait on a Saturday night. Tonkatsu Ramen: Solid Ramen with decent atmosphere. Huge $5 California roll that was pretty good. Ramen 930: We liked this one better than Tonkatsu Ramen although the atmosphere leaves something to be desired. Ramen Bar: Much better ambiance than Tonkatsu Ramen and Ramen 930 with great service but a limited menu. Corelife Eatery: A fast-casual “healthy” restaurant with bowls, salads, etc. It was really good. Great spot for lunch. Takashi: Fantastic sushi. Some of the best we’ve ever had. BE PREPARED TO WAIT. We got there at 5pm for opening at 5:30pm so we wouldn’t have to wait 1-2 hours. Amanda’s brother Evan and his girlfriend Katherine came to visit for a few days. 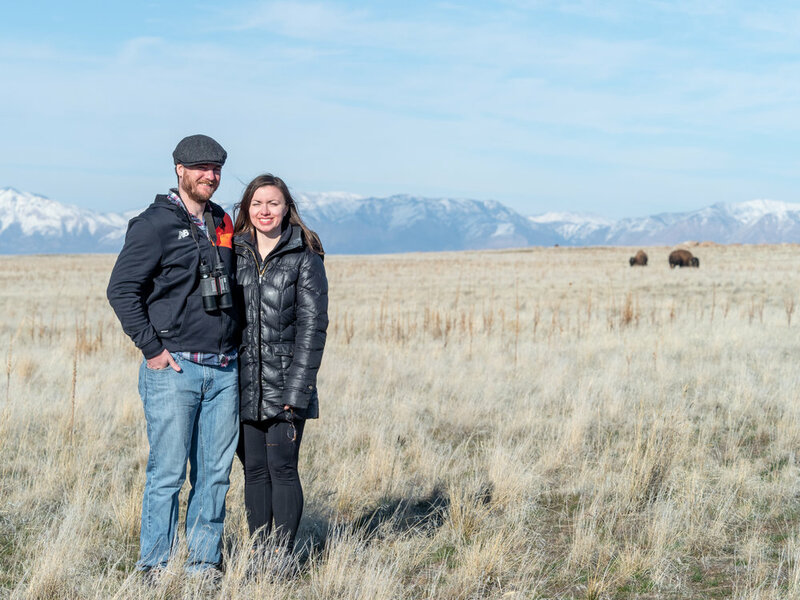 Here they’re posing with bison on Antelope Island.